Not to be confused with Australian football at the 1956 Summer Olympics. Following five withdrawals, the tournament featured three Eastern bloc teams and four from Asia. The other sides included in the draw were from the United States, Germany (West and East united), Great Britain and the hosts Australia, competing in their first Olympic football tournament. The tendency of Eastern bloc countries to provide state-funding for their athletes put Western amateurs at a significant disadvantage. As a result, all Olympic football tournaments 1952 onwards were dominated by the Soviet Union and its satellites. Five teams withdrew (Egypt, China, Turkey, South Vietnam, and the football team of Hungary, a nation that was cheered in other Olympic contests due to the ongoing suppression by Soviet troops), which left only three games to play in the first round. The Great Britain football team eliminated Thailand 9–0, and Australia defeated Japan 2–0. As five of the original sixteen teams withdrew, USA vs Yugoslavia match was postponed to the quarterfinals. 1 Egypt, South Vietnam, and Hungary withdrew. 2 Both teams withdrew; the match was scratched. 3 As five of the original sixteen teams withdrew, the match was postponed to the quarterfinals. Yugoslavia defeated the United States 9–1. Great Britain lost 6–1 to Bulgaria. Halfway through the game, ratings from HMS Newcastle vaulted the fence and exhorted the team to show more grit. They were peacefully escorted off the field. The Soviets drew their game against Indonesia 0–0 and won 4–0 in the replay. 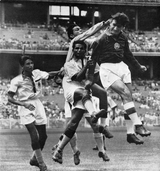 The Indians defeated Australia 4–2 with a hat trick by centre forward Neville D’Souza – the first by an Asian in the Olympics. Prior to the game there had been debate, once again, as to whether the Indians should be shod. Sir Stanley Rous respected their decision either way, although in the end, the Indians decided to wear boots. The Indonesian referee disallowed two first half goals. Bob Bignall the Australian captain was unable to get an intelligible reply out of him during the break. Yugoslavia defeated India 4–1. It would be their third consecutive Olympic final. The Soviets defeated Bulgaria 2–1. Bulgaria scored first and conceded two goals in the last six minutes of the game. Yugoslavia were playing Red Star Belgrade's Dragoslav Šekularac in this tournament; he would feature in the 1960 UEFA European Football Championship final. They lost 1–0 to a second half Anatoli Ilyin goal. Bulgaria took Bronze defeating India 3–0. Indian team at a tussle against Bulgaria at the bronze medal match. ^ "Football at the 1956 Melbourne Summer Games". Sports Reference. Retrieved 13 October 2018. ^ "News .....taken from "The Socceroos and their Opponents" by Laurie Schwab". Australian Online Soccer Museum. Australian Soccer Preservation Society. Archived from the original on 27 August 2006.